Hello Nachos! The year 2016 has come to an end, and we have nothing to do but be proud of all what we did last year. There have been many great soldiers that passed from this remarkable army, and they should somehow be awarded for their work and time put in for our success. How? By receiving a NOTM Award! Continue reading to find out who the next Nacho of the Month is 😀 ! Due to the fact that there are so many amazing troops in the army, it can be quite difficult to only choose one for this prize. A new troop will be chosen each month so don’t be upset if you haven’t gotten it this month as you’re always in with a chance next time! This was very hard for me, I just couldn’t decide the Nacho who had that tiny advantage over the other. After much, much consideration, I decided that it would be fair if we nominated some of our many amazing soldiers, and whoever does accomplishes some specific tasks first wins the ultimate prize! Congratulations, Aru! 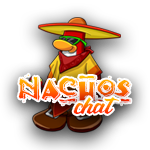 You’ve proven to be a very loyal Nacho, as well as an amazing moderator on chat. Good luck, Aru, and keep it up! Although you illegally stole my daughter and married her, I will still nominate you for this competition, as your activity, passion and loyalty is outstanding, and not many Nachos have the talent that you carry upon your poncho. Good luck, Tom. Delfi, you joined just 24 days ago, on December 9th. However, you’ve showed us your will to help this army by remaining loyal, attending almost every events and commenting a lot. 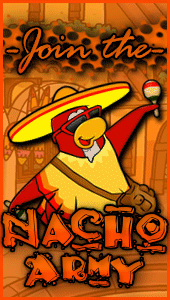 I wish you the best of luck, and make sure to keep being active, Nacho! Be on chat for more than 2 consecutive hours(take pic of the bot after saying “!active”). Comment on 3 posts(Not spam). 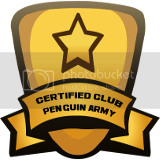 Recruit a penguin and have it comment on the site. Lead a tactic during an event. PC me a tip/advice on anything, such as leading, tactics etc. If you want to be the next NOTM, then show us your loyality and passion, and we will gladly award you! Lego’s Fact of the day: Did you know that we have never ended up out of the podium of CPAC’s 4 March Madness’s that were hosted? We actually won I, II and IV, while we won our 3rd place battle in III vs the WV! Im so happy! Thank you lego!